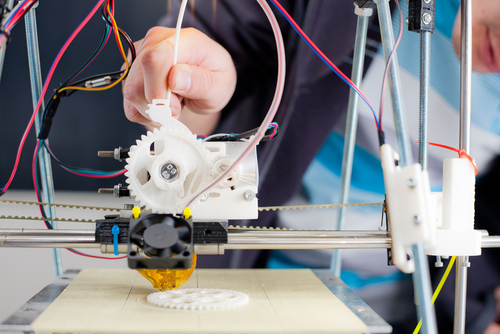 Plus, the possibility of being able to print our your own objects and materials opens the door for endless possibilities in professional fields such as industrial design, jewelry design, engineering, aerospace, education, architecture and more! Given that this amazing advancement in technology has such an opportunity to be a useful innovation for everyone from students to technological inventors to the average printing enthusiast, it is no surprise that many companies are beginning to find a way to incorporate 3D printing into our day-to-day lives. In fact, Microsoft just announced this past Wednesday, June 26th that the new Windows 8.1 will feature plug-and-play support for a number of 3D printers―no installation necessary! While 3D printing may not be a requirement for the average computer user (yet), many designers, inventors and early adopters of 3D printing were delighted at the announcement of an easy-to-use, no software necessary printing system. In the big Windows 8.1 announcement, it was revealed that all you have to do to start creating your own three dimensional objects was to simply plug in your 3D printer and hit “print.” Your computer would know how to do the rest. This is an especially exciting announcement for current users of 3D printers because the process of printing these 3D models could be described as anything but simple in this day and age. In fact, most 3D printing apps make is so that you have to craft your design inside of the app, and then spend the time translating the creation into a complicated format that your printer’s software will recognize. Luckily, the Windows 8.1 announcement to promises to cut out this complicated process. The fact that a company as big as Microsoft is already getting on board with 3D printing so early on in the trend is also a great sign of what this type of technology looks like in our future. Windows remains the world’s most popular and most used PC operating system, and Shanen Boettcher, the general manager of Microsoft’s start-up business group, cited the inevitable possibility of 3D printing going “mainstream” as one of their main reasons for building it into the new Windows operating system. This point is driven home even further by the fact that Windows also announced that the MakerBot Replicator 2 3D Printer―one of the leading 3D printers on the market―will not be available to purchase in select Microsoft stores. What do you think about Microsoft’s recent announcement to incorporate 3-D printing into the upcoming Windows 8.1 operating system? Do you think that 3D printing will become such a common thing in the future that the average PC user will utilize this program? Let us know your thoughts in the comments below!